It's one of the trendiest colors for bedroom decors - orange. You can use it in a bedroom as a main color choice or simply as an accent color. No matter what shade you choose - from apricot to pumpkin to melon - it's sure to make a statement. 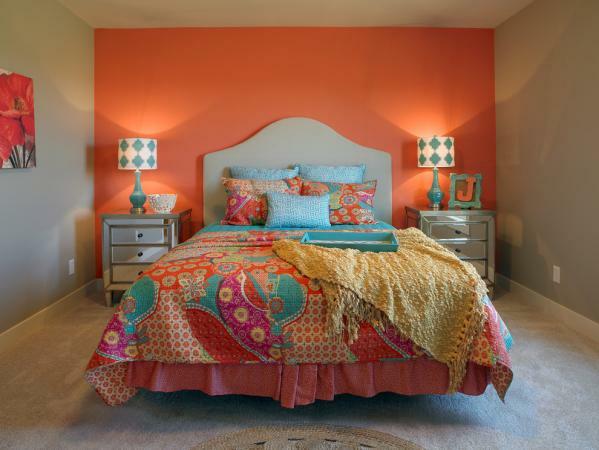 Using complementary colors in a bedroom decor creates a stunning décor. To find the complementary color to any color, simply use a color wheel chart. The complementary color is the color opposite it on the color wheel - blue. Designers understand that complementary color schemes are dynamic, dramatic and offer a stunning design choice, especially for a bedroom. Paint the room a medium value of orange. Layer the room with darker shades to add depth, such as lamp shades, pillows and accessories. Select a unique headboard, such as a hand-carved screen and paint it a medium blue. Use darker blues throughout the bedroom to add color depth. Place small colorful rugs over hardwood floors or carpeting. Add a white accent color throughout, such as a pair of footstools and pair of gourd-shaped table lamps. You can make a bold statement with an accent wall. Select the hue and paint one wall, ideally a solid wall not broken up by windows. The wall behind the bed is usually a good choice for an accent wall. Choose a contrasting color for the other walls in the bedroom. This can be one of the many values of taupe or a darker brown. Other contrast colors include, green, gold or white. Create symmetry with matching nightstands and table lamps. Use a complementary color scheme with an orange accent wall. Select a headboard that repeats the color of the other bedroom walls. Mirrored nightstands can expand a room by reflecting light. Add a bedspread or comforter that also includes blue, purple, and gold. Continue with one of the accent colors, such as gold with a throw, fabrics and accessories. Repeat the colors with solid and pattern fabrics. Add wall art featuring darker rust tones and taupes. An orange bedroom doesn't have to be the bright color of the fruit. Instead, take a page out of Bespoke Fine Interiors for this melon and taupe color scheme. The designer chose a soft melon paint color from Sherwin Williams for the main wall color and a white for the trim. This bedroom features customized furniture from Vanguard Furniture, such as the upholstered bed and marble top nightstands. The lamps repeat the softer contrasting taupe color used throughout the room design. White lamp shades repeat the trim color. The Eastern Accents bedding provides a link between the taupe carpeting, headboard, blinds and the melon-colored accent wall. 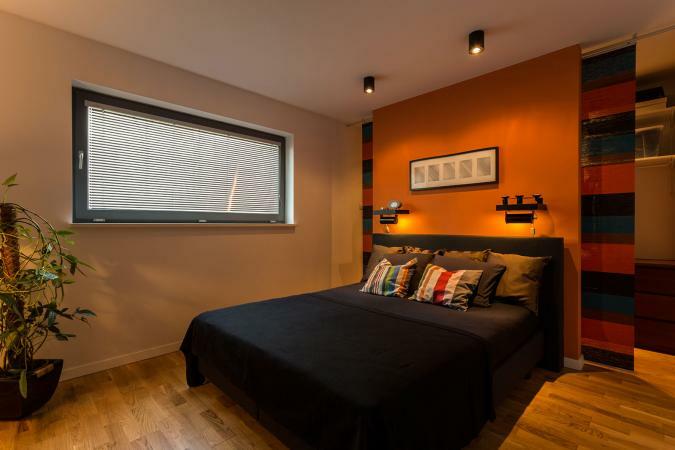 Orange can be used for a variety of different design styles, from contemporary to masculine. 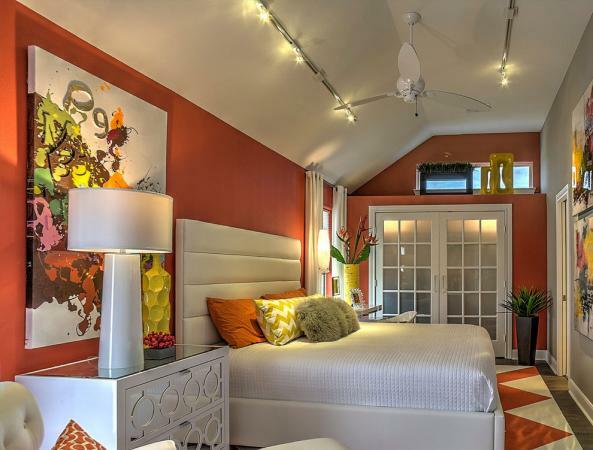 Use a color combination of orange and white to create a striking bedroom design that features a unique ceiling design. This bedroom features a warm burnt huge as a wall color that is repeated in the rug. White leather upholstered headboard and bed frame become a focal point. A chevron rug peeps out from underneath the bed. A large white stylized table lamp adds interest. A mirrored nightstand will reflect overhead track lighting. Oversized canvas art introduces lime, pink, and yellow into decor. A yellow vase introduces an accent color. Bed pillows repeat colors in decor. A masculine bedroom design can be created using a bold color scheme that includes chocolate. This bedroom features a design solution for a missing built-in closet by creating a half wall for the bed. The half-wall is painted a bold hue with two can/pot ceiling lights mounted over the bed. Two wall sconces are mounted on the half wall. A curtain rod is suspended behind the half wall and provides a unique and very effective design element for a wide horizontally striped curtain. This small addition provides a walk-in closet space directly behind the bed. A chocolate brown bedspread and upholstered headboard with lighter brown pillow shams are accented by vertical stripe pillows. You can add several accessories to give your bedroom design greater depth and interest. When selecting accessories, keep in mind the size, proportion, style and color so that everything you add fits in with the overall room décor. 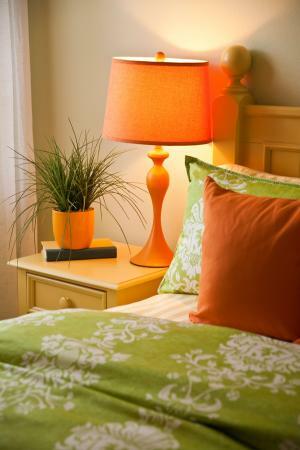 A unique style table lamp with a colorful body and shade can be placed on nightstand or dresser. An apricot-shade retro twin bell alarm clock can be set by the bed. A Himalayan pillar style basket salt lamp has a soft warm glow. An electric hued lava lamp adds a subtle ambient light. Tangerine or apricot-colored LED candles can be placed on a dresser or nightstand in a group of three with varying heights. Add a couple of throws and decorative pillows. Vases and urns are great ways to introduce colorful accent pieces. Vintage glass bottles can be displayed on a bedside table, dresser or floating shelf. A Capiz lotus style votive candle holder is a nice touch. Create a focal point with a framed mirror in your favorite shade. A fast transform for your bedroom can be accomplished with two simple elements: a large rug and bedding in your favorite shade. Add a few other accessories that repeat the orange color. Layer various light and dark oranges throughout the room for a great look. Select a unique rug shape for greater design interest and effect. Choose orange-striped bedding featuring several hues ranging from light to dark. Use a mix of throw pillows in solid colors and patterns. Find great wall art and create a gallery wall or add a few pieces above the bed/nightstands. Add colorful blinds or shades. Select gauzy curtains in your shade of choice or bold multi-hued striped curtains. Paint old nightstands a pleasing shade such as tangerine. 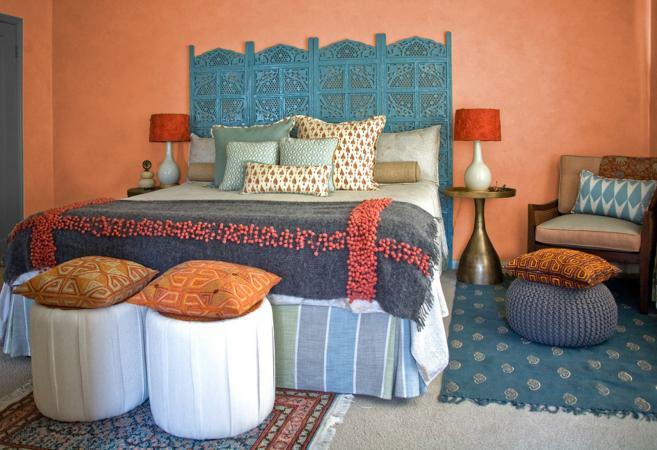 Decide on how much orange you want in your bedroom décor and create a plan for flooring, walls and furnishings. Be sure to layer colors, textures and sizes for a balanced bedroom design.